Amateur sculptor Wang Wenhai's passion and love for Chairman Mao has given birth to thousands of sculptured images of the great Chinese leader. Many of the works are unconventional Mao as Buddha, as a lady, and as a comfortable pillow to rest on. These works would have put Wang in serious trouble during the tumultuous years of the "cultural revolution" (1966-76) but Wang says there is always a noble reason behind each artistic expression. One of his recent works is a Mao portrait with many eyes painted on the body of a bell. That was Wang's reflection of Mao, in today's money-oriented society. 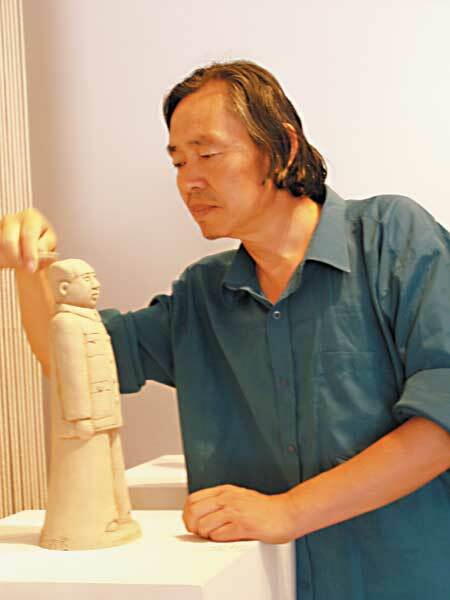 Wang, 55, started to craft sculptures of Chairman Mao in the early 1970s and has been a devotee to Mao all of his life. Born in Central China's Henan Province, Wang moved with his father to Yan'an, Shaanxi Province in the 1960s. Yan'an was the cultural bed of the Chinese revolution and the final destination of the Long March. Wang became a guide for the Yan'an Revolutionary Museum after his graduation from college in the early 1970s. Since then he has developed an intimate and special relationship with Mao expressed through his art. He is known by his friends as the King of Clay Sculpture because of his prolific efforts. This weekend is the last chance to catch Wang's interesting collection at the Margin Art Space at 798 Art Zone. The exhibition closes on Monday. Margin Art Centre, 798 Art Zone, 11am-6:30pm, everyday except Mondays till July 31.